Among the few lines that Marco Quagliarini has added at the start of the score of Dal nero del tempo, there is a very short sentence without a main verb, almost a note addressed to himself rather than to us, which provides the essential key to penetrate his compositional and personal world: “Iniziare un lungo viaggio come un pellegrino diretto alla sorgente” (“To begin a long journey like a pilgrim headed for the source”). A poignant poetic image comes to mind, that of the two young souls who in Tenth elegy of Rainer Maria Rilke’s Duineser Elegien overcome the shapeless torpor that seems to characterise the grey beyond and undertake a journey that leads them ever closer to what at the start of their path seems just a simple, distant point of light: die Quelle der Freude, the Source of Joy. One could, of course, also quote the journey of Dante, but it is Marco Quagliarini’s peculiar approach to composition that is Rilkian: composing more as an ethic than a musical necessity, or rather, as an indispensable inner need that finds its means of expression in music, its own way of unravelling the enigmas of existence (or attempting to do so) through the complex and captivating vicissitudes of pure sound, of the gestures and figures of music. His is a religious approach to composing that imbues each piece with a depth that is immediately evident to the ear of the careful listener: the formal contours of the piece are broad and complex, surely not for self-satisfaction, but because the journey towards the source is of necessity complex, intricate and without certainty. Further proof that composing is, for Quagliarini, a “mirror of the soul” comes from the fact that his musical ideas do not stem from a pure fascination for timbre or sound, are not born from the instruments available to him, but they simply find in them the means to coagulate, to give form and expression to a nameless interior energy. This does not mean, of course, that the composer is indifferent to the sound and instrumentation – on the contrary, his competence is manifest at every step – but it means that his priority lies elsewhere, at a deeper level: certainly, the crystalline quality of the start of Movimento could only be embodied by the piano, just as the hypnotic lilt of the melodic line that crosses Dal nero del tempo several times can only be captured by the cor anglais, but it is the abstract interior properties of the crystallinity and the hypnoticity that are at stake here and they find their best expression in those particular instruments. 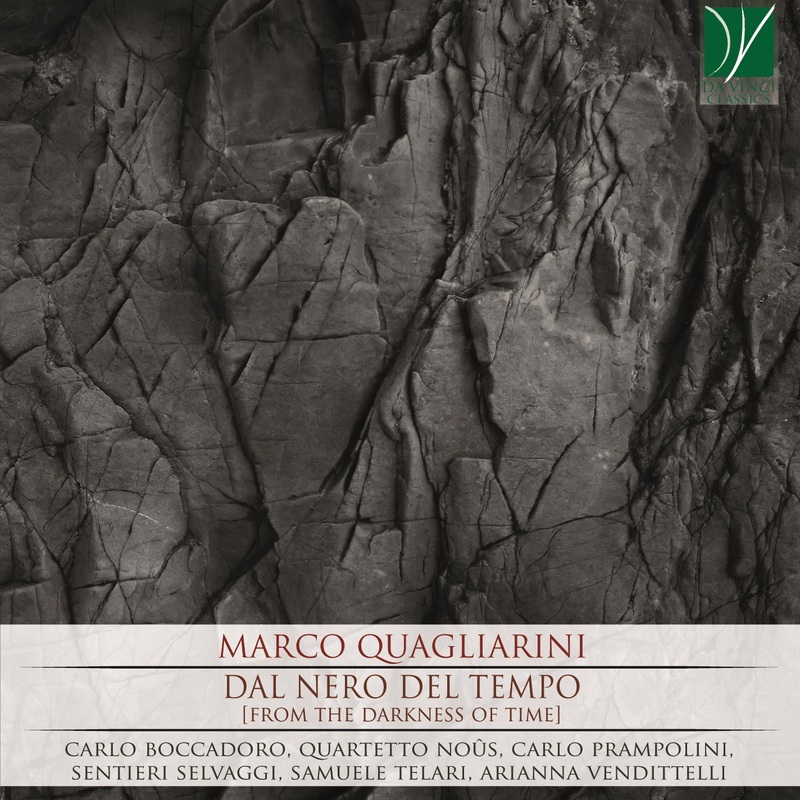 Another general consideration before going into the details of the single pieces concerns the relation Marco Quagliarini has with the history of musical language. He possesses a strong “sense of tradition” (by no means to be confused with academicism, its opposite), that is to say he has absorbed the paths of music of the distant and more recent past (it should be remembered that he was an excellent instrumentalist before studying composition with teachers such as, in order, Vandor, D’Amico and Fedele) to such an extent that every step proves to have “long roots”, in other words makes unconscious references to historical worlds simply because they are necessary to his own music at that given moment. So, if at times his fondness of Bartók’s quartets emerges in Dal buio and Schoenbergian-Bergian assonances can be discerned in Movimento, this in no way implies being retro, but rather that his music has deep and enduring roots. The same could be said of the clear tendency towards melody and lyricism that pervades almost every piece, often becoming its mainstay. Marco Quagliarini: Pianist and composer, was born in Torre del Greco (Naples). At a very young age he studied the piano under Marino Mercurio, with whom he later gained a diploma with full marks and distinction at the "Nicola Sala" Music Conservatory in Benevento. He went on to study with the well-known Russian pianist Lazar Berman, and followed numerous master classes held by the pianist and his wife Valentina, finally concluding his studies at the Accademia Musicale in Florence. He first studied composition under Gaetano Panariello, with whom he gained a diploma in Choral Music and Choral Conducting. He went on to gain a diploma in Composition in the class of Ivan Vandor at the Conservatory of S. Cecilia in Rome and subsequently obtained the second level Diploma Accademico in Composition, with full marks and di-stinction, under Gianpaolo Chiti and Matteo D'Amico. In 2009 he gained full marks in the Advanced Diploma at the Accademia di Santa Cecilia in the composition class held by Ivan Fedele, being awarded the prestigious "Goffredo Petrassi" prize by the President of the Republic. In the same year he was one of the three finalists in the Santa Cecilia International Composition Competition in Rome. His works are performed by several ensembles among which the most important are ”Ensemble Recherche”, “Dèdalo Ensemble”, “Sentieri Selvaggi”, “Slgoritmo", "Contempoartensemble", “Quartetto Noûs”, ”Freon Ensemble”, “Imagosonora”, “Ardorè Duo”. In 2010 he received a prestigious commission from the Accademia Filarmonica Romana for a piece for orchestra. In 2012 the Orchestra Nazionale della Rai of Turin gave the first world performance of his composition “Events” for large orchestra in the season Rai Nuova Musica. In 2015 he received an important commission of a composition for ensemble from the Amùr (musical associations in the network). In 2016 Aracne Editrice published his book “Costruire la musica”, a method of musical composition. In 2017 he published his CD “Riflesso” with Stradivarius. His works are published by Edizioni Suvini Zerboni - Sugar Music S.p.A.